Comments The emerald is a beautiful gem and stands out because of the rich, luscious color it possesses. It captures the imagination very effortlessly and sits confidently and beautifully in any piece of jewellery. Featured today is a lively natural emerald. This particular classic emerald cut beauty is an emerald of Colombian origin of 2.09 carats and finds distinction due to its deep, rich, saturated and evenly spread green color. 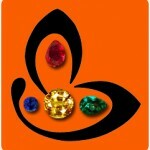 The intensity of the gem is palpable on a single look. 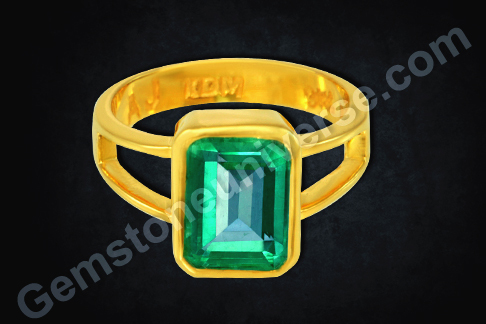 The gem has been crafted into a fine ladies emerald ring set in 22 karat gold. Note the clarity of the gem and also the fact that it is a fine an even green, without any tint of blue which makes it a prized Colombian emerald. The is a fully natural and untreated gem which makes it the optimal choice for crafting of a pure, powerful and saatvik Mercury/ Budha talisman.